My original complaint with season one of American Horror Story was that my favorite characters were killed off, so what was the point of getting invested in characters who would only die? (It’s also sort of how I’m feeling about The Walking Dead at this point.) But then in season two of American Horror Story, the Asylum story arc, some of the first season’s actors did come back, but as different characters. I followed the second season for a few episodes but had to quit when Dr. Arden (James Cromwell) started performing unnecessary amputations—I have a really hard time with mutilation. With this third season of American Horror Story, the Coven story arc, I have a feel for what’s happening with the series and the different incarnations of the characters. It reminds me a lot of Japanese storytelling, like the manga series Umineko and Higurashi, where a set of characters is presented and one story line, and then in each arc, bits and pieces of a larger story are revealed and characters are reincarnated and given a second chance at getting their lives right in a different story line. I’m as in love with the setting and the stories American Horror Story: Coven brings along with that as with the returning actors. The ghost stories associated with New Orleans are ripe for telling, and I’m surprised they haven’t been featured more often in books, movies, and TV. There’s the story of Marie Laveau, the voodoo priestess who supposedly haunted New Orleans’ streets for a century, never changing physically. Before I’ve relied on Jewell Parker Rhodes’s Voodoo Dreams, a historical novel about Marie Laveau, to get my fix. 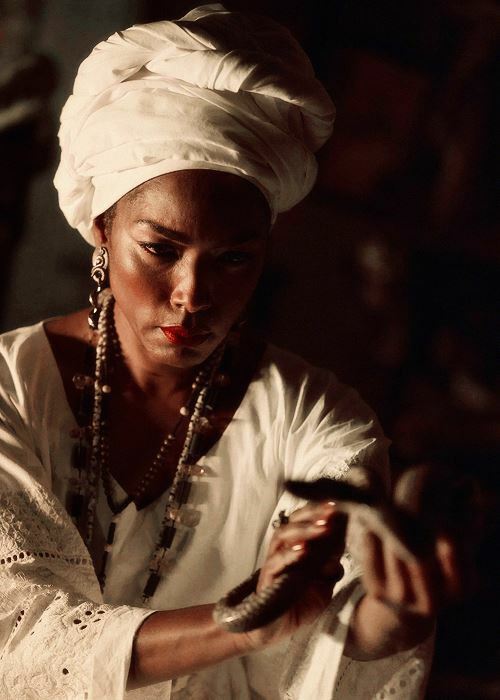 Now I get a modern, tart version of Laveau with Angela Bassett’s portrayal of her. Laveau was a hairdresser in nineteenth-century New Orleans, and some people say that’s how she knew so many secrets rather than through voodoo. 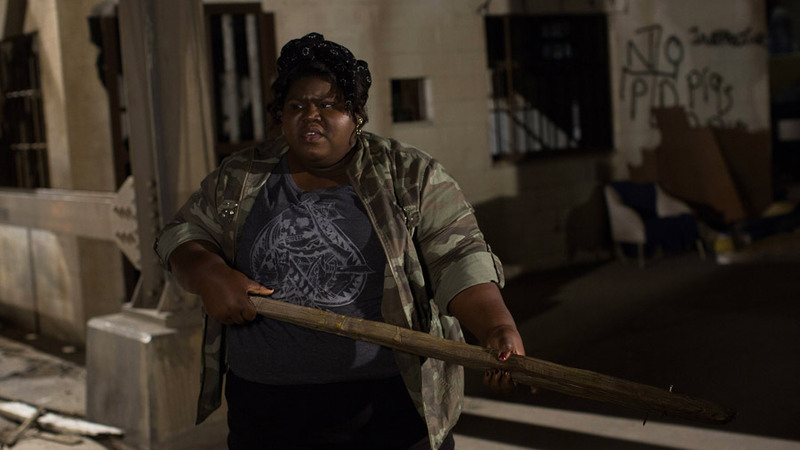 In American Horror Story’s modern day New Orleans, she’s shown running the hair salon Cornrow City and plotting to get rid of the rival coven led by Fiona Goode (Jessica Lange) and her teen witches Zoe and Nan (returning actors Taissa Farmiga and Jamie Brewer), Queenie (Gabourey Sidibe), and Madison (Emma Roberts), who Laveau says has stolen the magic of her people. One of the most horrible stories of New Orleans is that of Madame Delphine LaLaurie, a high society lady who mistreated her slaves and, some say, performed sadistic experiments on them. Madame LaLaurie was exposed when a slave set the house on fire, trying to kill herself rather than be subjected to any more cruel treatment. Authorities found Madame LaLaurie’s torture chamber and the woman was forced to flee New Orleans. The only visual I’d seen before for this story is the tableau at the New Orleans wax museum, and that’s pretty scary. American Horror Story: Coven brings in Kathy Bates as Madame LaLaurie, and the writers have bent these two ghost stories so they intersect in the series. Madame LaLaurie ends up being cursed by Marie Laveau after torturing Laveau’s lover in a scene that’s very graphic and unsettling. Many years later, Fiona resurrects her. American Horror Story’s version of Madame LaLaurie is a much different take from what I’ve heard before, where the wealthy woman was sent off to Paris, France, by her son and always hoped that gossip would die down one day so she could return home. Supposedly, she never understood why people couldn’t forget about it, and it’s this racist that is dug up in modern day New Orleans. Kathy Bates’s Madame LaLaurie is unapologetic; I haven’t seen her play anybody so terrifying since her turn as Annie Wilkes in Misery. She softens when she’s revived in the current century, and there end up being some really funny moments as she confronts society today, like when she’s shown weeping as she realizes President Obama is in the White House. It’s tricky showing racism as it exists today in America, and I like how the show has come up with the device of a 200-hundred-year-old racist interpreting modern culture to give commentary—the old ways confronting the new. Too often, the subject is only viewed from our racist past with movies like The Help, 12 Years a Slave, and Lincoln, as if the years give us safety from uncomfortable truths. I also like the unlikely friendship that springs up between Queenie and Madame LaLaurie and how they’ve come to bond over fast food. Queenie’s talent in the young witch coven is quite unique; she’s like a reverse voodoo doll, using her body as the doll’s to inflict pain on her enemies. Her move over to Marie Laveau’s camp seemed natural to me and was a much more interesting story than what had been composing most of American Horror Story up until last week: the battle going on for the coven. Because Queenie’s been able to heal herself after doing her particular kind of magic before, I don’t think she’s completely out of the picture yet. She took one for Marie Laveau in episode nine, but she’s left beside the powerful voodoo priestess of New Orleans. I hope the next four episodes continue to focus on the issue of racism as it exists today rather than the bickering that’s been going among the teen witches as they try to figure out who’s the next Grand Supreme. Queenie’s diversity training for Madame Lalaurie, consisting of the miniseries Roots and footage shot during the civil rights era, seemed to be working miracles on the old racist, and I’m hoping other miracles are yet to come.